The walk will share a common start line with the 5k before taking a different route through the community on paved roads and paths. On-Line Registration closes at 4 pm Wednesday 11-22-17. In-Person registration will be available Wednesday, 11-22-17 from 4-8 pm at SHCO Division 5 firehouse at 1542 Chapel Rd. and also on-site at the race on 11-23-17 starting at 7:30 am. Proceeds will benefit the Susquehanna Hose Company's equipment fund. The event will be held rain or shine, and entry fees are non-refundable. SHIRTS ARE NOT GUARANTEED TO THOSE REGISTERING AFTER 11/14! The course will weave through the Bulle Rock Community and Bulle Rock Golf Course on paved roads and paths. Strollers, pets, roller skates, and other wheeled devices are not allowed on the course for the 5k. There will also be an award for the youngest and oldest 5k participants! Professional chip timing by Blue Cheetah Sports Timing for all 5k participants. 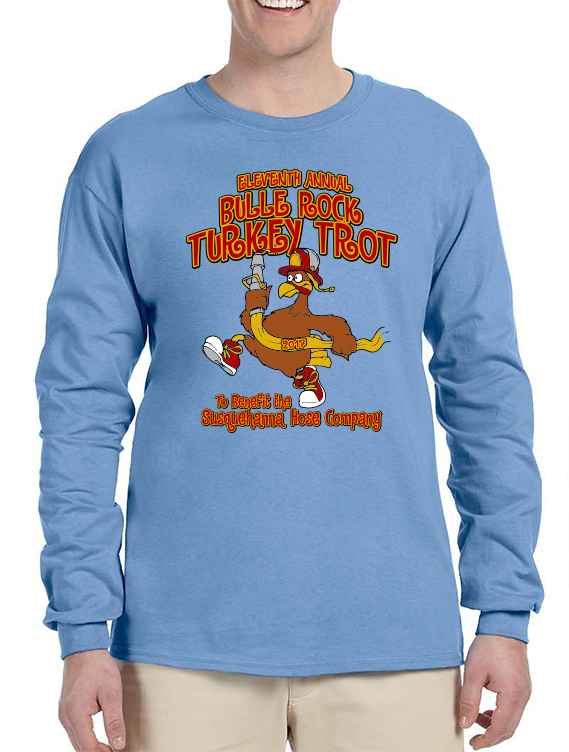 Long-sleeve t-shirts are only guaranteed to participants who register by November 14th. If you do not register by the 14th we cannot guarantee that you will receive a shirt. Post-race food at the Residents’ Club! Water will be available at the halfway point of the 5k course, and course marshals will direct racers at major turns. Dogs and other pets are not permitted on the 5k course. Packets will be available for pick up on Wednesday, November 22nd at Susquehanna Hose Company Division 5 at 1542 Chapel Road, Havre de Grace, MD 21078 from 4-8 PM. Packets will also be available beginning at 7:30 AM in front of the Residents’ Club at the registration tent. Due to time constraints on race day, we HIGHLY ENCOURAGE participants to pick up packets on Wednesday.